Ginger and scallion chicken (姜葱鸡) is a traditional Chinese recipe. As simple as the ingredients sound, this is not an easy dish to cook well. This dish needs a lot of wok skills. Hence, this ginger-and-scallion style of cooking is often my taste test when I go to a new Chinese or Cantonese-style restaurant. If a chef can make a mighty wok hei-infused ginger-and-scallion dish—be it chicken, beef, ginger and scallion crab, or lobster—it’s a sure fire sign that the food will be great. At home, I like cooking this dish when I want something quick and simple with my steamed rice (aka 30-minute meal) . I once asked a master Chinese chef and he told me that potato flour is preferred as a tenderizing agent due to the gelatinous texture. He also told me that a wee bit of baking soda will do even more wonders to tenderize the meat, which you can learn all about it on my cashew chicken recipe post. Ginger and scallion chicken and steamed rice is my ideal and homey meal. Try this ginger and scallion recipe at home and it will become your dinner table staple. Ginger and scallion chicken is an easy Chinese chicken dish made with ginger, scallion and chicken. Easy ginger and scallion chicken recipe. Heat up your wok and add the remaining cooking oil into the wok. When the wok gets very hot and begins to smoke, add in the ginger and stir for a few seconds, then add the white part of the scallions and stir a few times. Add in the chicken and continue to stir well. Just when the chicken starts to cook through, add in the oyster sauce, sesame oil, cooking wine, white pepper, sugar, and toss the wok a few times. Add salt to taste, if it's not salty enough. Add in the green part of the scallion, stir quickly and remove from heat and serve immediately with steamed white rice. All photos and recipes on Rasa Malaysia are copyright protected. Please do not use the photos and recipes without prior written permission. If you wish to republish this recipe, please rewrite the recipe in your own words instead of copy and paste and link back to http://rasamalaysia.com/recipe-ginger-and-scallion-chicken/. Thank you very much! Love this quick, healthful dish! It’s beautiful like spring time. I love this dish but I personally prefer beef as the main meat. I am so glad that you’re back now as I have missed your posts. Going to try out your ginger-scallion recipe on my next day off. I hope you had a blast of a time in sunny Penang!! Yes, those wok skills are hard to master, but it looks like you did it quite well! You are a wok pro Miss Rasa Malaysia! Yeah, the bicarb is usually used for beef to tenderise it. Love this combo of yours! Yummy! But has anyone tried the Puter Nasi kandar restaurant in Perth which is said to be owned by PM Abdullah’s brother Ibrahim and a Chinese man? If true, what a story – Ali-Baba in Australia but Ali running the show! Only thing bothering me about this story is why would Abdullah’s brother want to work to Australia? Something wrong there. Could you find a recipe more simple and more delicious than this one? I don’t think so!!! Asian food is so full of tastes and colors… All your recipes are the best examples. Can’t wait for the next recipe!!! Mine is usually done bone in. That flour tip works well with pork too. My mother (I’m half Chinese/Malay) swears by baking soda when she makes beef in oyster sauce – it really does make meat very tender. Cornstarch and arrowroot powder are culinary necessities in Chinese cooking. They add the essential nuo mouth-feel to the food. Nuo is that sticky, starchy feel commonly associated with glutinous rice, and is considered one of the three ultimate textures in Chinese cuisine. That dish is certainly restaurant quality. Ahh… so that’s the secret — marinating the chicken first! I have always just fried them as is. Now you tell me, it’s marinate first and with potato flour at that. Maybe now my family won’t complain so much when I cook this (I’m the only who likes chicken breast; they find it too dry and prefer drumsticks/wings). Babe – exactly, it’s very versatile! TruebluePenangite – yes, I have a great time in Penang. Have fun cooking. PE – not really…there was no wok hei in my dish because smoke alarm didn’t go off this time! Teckiee – yes, just use some potato flour or corn flour and you will have juicy meat. Allan and Nigel – I agree, the prawns in restaurants are all tasteless but great texture! Kok – yes, let me know how it goes. Missyz – I have yet to use baking soda to marinate meat, must try now. Nate 2.0 – thank you. Now you can make it at home. Rosa – green, yellow, white and creamy meat color…yes, very nice. Kenny – yeah, try the marinate the meat in the future. RM,what a coincidence! I made the almost similar dish on Thursday for dinner but could not post cos my hosting is down! ha ha ha! great minds think alike! 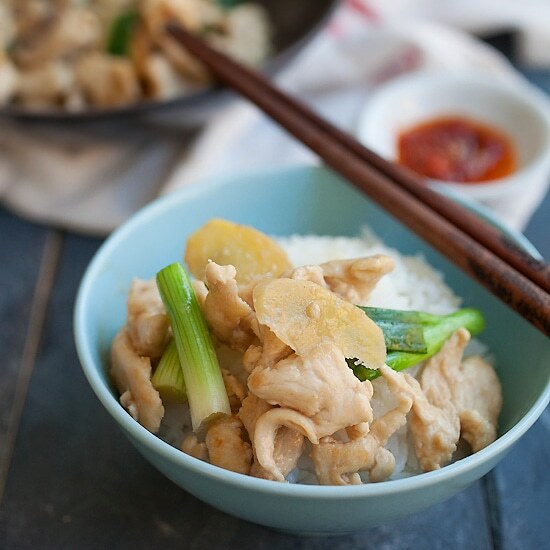 I used chicken pieces, spring onions and young ginger slices blah blah blah …. looks great, bee! love the simplicity of this dish, and allergy-free too! one of my fav dish! reminds me that i have not had this for some time. i know exactly what you mean about ginger infused wok-hei flavors. theres a place in chinatown that has a ginger fried rice that is so simple to look at but the ginger and green onion flavors are out of this world! i;ve never tried to recreate it at home…this looks so wonderful! Droooool! Un très beau site de belles recettes..! Budding Cook – yes, please try the recipe and let me know how it goes. Aria – exactly. There is one Chinese restaurant here that serves great “ginger and scallion fill-in-your-blank” with killer wok-hei…yum. It’s really hard to get that kind of wok hei at home. Mon c’est trop beau !!! God, it too nice !!! your pictures are just fantastic…for a so “simple” recipe… I love it ! Thanks for the tip about the baking soda, I didn’t know about it… I’ll try it next time I use both chicken and my wok. Qn:Is your wok a non-stick teflon wok? Mine is, and I am afraid to heat it up too hot (until smoking) cos I thought that would destroy the teflon coating. Any comments? emmm, this dish looks clinical altho i can sense its appeal! i always though chicken with bone churn out a better dish, instead of fillets etc. i love this recipe, using fish… one of my ‘must order’s when i go out to eat.. i tried replicating this dish at home, but my fish turned flaky, and mush. anything wrong with what i’m doing? i htink the fish i’m using is basa freshwater fish. Im a fan of this recipe.Ive eaten it in many places back at kl & penang and all of them tasted good.The BEST is at jaya jusco prai penang at the food court.There's only 1 spot where they sell on the spot chinese dishes with rice.Awesome! How much exactly is one chicken breast fillet (in weight)? Thanks. One boneless and skinless chicken breast is about 8 oz to 10 oz, depending on the size. well, I have a outdoor high btu wok burner for us in spring and summer. I tried this dish, and managed to get some flames in the wok. Basically i was heating wok for a long time, and once oil smoked a lot it was small flames in the wok when ingredients were added. I constantly tossed the food, and achieved some flames. The result was actually quite impressive. Isn’t this what they refer to as the “bao” technique? Potato flour for marinating the chicken pieces – may I know is it sweet potato flour or potato flour ? sweet potato flour is difference from potato flour ? or the same thing. Hello, I have made this dish several times using this recipe and the flavour is wonderful. The only problem I have is that the spring onions wilt whilst the chicken is cooking, which looks quite unattractive. Any tips on how to prevent them from wilting in the heat? Add them towards the end. Quick question, when you say “add oil to seal in the juice of the meat,” do you mean coat the chicken in the oil and THEN add the potato flour? Or add the oil to the potato flour and mix it together and THEN add the chicken? Sorry I’m kind of new to cooking! Also, is it necessary to use a wok to cook this dish? Thank you in advance! After coating the chicken with potato flour, then add the oil. This will make the chicken extra moist. I was just going to ask this question. Looking forward to trying this. Why potato flour or corn flour? Why not regular flour or cornstarch? You can use cornstarch. They work all the same. This was a great meal. The chicken was very juicy and the ginger and scallions added so much flavor. I did notice that mine was a lot browner than the one you pictured above. Do oyster sauces have a lot of variety ( in hue and taste )? Thanks for the great recipe. I’ll be visiting your site often. Simple but delicious, even the malay communities appreciate it and made a malay version called ayam masak halia. This dish is all time favorite. Anything I can substitute for the oyster sauce without soy or mushrooms? My Chinese restaurant won’t give me the recipe but said they use ketchup? No, they don’t use ketchup. You can use Bragg Liquid Aminos if you don’t want to use oyster sauce.